Are These Twitter Tactics Effective? More than any of the popular social media networks, Twitter seems to be the one where marketers struggle the most with to get any measurable return on investment from. Whatever the reason, it's not as effective as enterprises hope that it is, or that the digerati seem to tout it being. Either way, as a marketer, you know that you need to maximize your time and monetary investment in the platform. But how and in what way? ExactTarget's recently released Audience Growth Survey, which examines Email, Social and Mobile, provides some potential answers, sharing some rather practical and effective tactics for using Twitter. While you'll likely be familiar with many of the approaches, it's certainly interesting to see how marketers rate which tactics are effective and which are not. 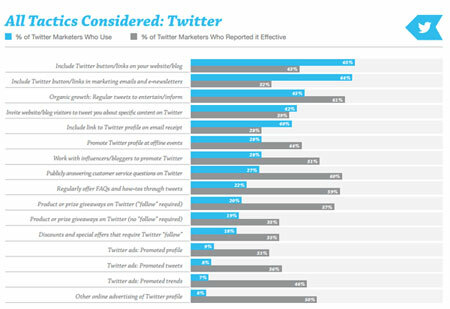 The most used Twitter tactic among respondents was including Twitter buttons and links on a website or blog - 65 percent of marketers used this tactic with 43 percent reporting it as effective. The tactic of including Twitter buttons and links within marketing emails and newsletters was used by 64 percent usage respondents but just 32 percent found it effective. Obviously, the trick is going to be to use a tactic that few (or fewer) marketers use but one(s) that generate the best return or response - and there are many according to ExactTarget's research. For example, publicly answering customer service questions on Twitter was used by only 27 percent of respondents but 60 percent claimed the tactic was effective. Click the image below to see the entire chart of Twitter tactics and their effectiveness ratings.